When we think about the hospitality industry, what often comes to mind is the food, cocktails, hotels, bars and restaurants. But behind all that, what is hospitality, really? Look up its definition and you’re reminded that hospitality is “the friendly and generous reception and entertainment of guests, visitors or strangers”. Essentially, it’s the people who are at the root of the hospitality industry. It’s built on kindness, being hospitable to others and showing compassion. Without the people, the industry doesn’t exist. Here at Typsy, we want to help fuel that and be that kind stranger who smiles at you, or the person who helps you when you need a hand. That’s why we’re supporting hospitality social enterprises with Buy one Give one. Let’s look at how we can all help support those doing good in your community, with our new Buy one Give one social enterprise. Jono, our CEO shares his thoughts and ideas behind the cause. Jono: “So the idea behind Buy one Give one, is that we’re giving the gift of training and staff empowerment by supporting social enterprises who are making a positive difference to the community. When your business joins Typsy as a member, you then have the option to nominate a social enterprise who is using hospitality as a medium for positive change. The people and organizations using hospitality as a force for good deserve our support. Jono: “It’s quite simple actually. Once your business joins Typsy as a member, our customer success contact will ask if there is a social enterprise that you would like us to support by nominating and ‘giving’ a Typsy lifetime membership to. Which social enterprises are already involved? Jono: “A fantastic social enterprise we’ve teamed up with is Scarf in Melbourne. Their team does some great work in giving young people a fair go, as they face barriers in otherwise gaining jobs or skills in hospitality. With hands-on-training and support from mentors, these trainees then go on to get involved in Scarf Dinners. 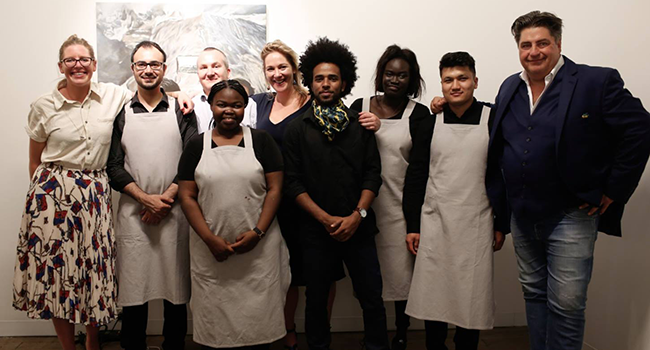 These are pop-up dinners that are hosted at iconic Melbourne restaurants throughout the year, allowing Scarf trainees to apply their newly learned skills through amazing dinner services. With our Typsy training platform, Scarf trainees gain real-world industry skills and knowledge that complements their on-the-job training. Learn more about Typsy's Buy one Give one social enterprise and get in touch with us to get involved. New feature: Upload your own training content to Typsy!